Your camera can now be set up directly from the mydlink Lite mobile app. This app allows you to easily set up your camera directly from your phone or tablet. Scan the QR code with your mobile device. 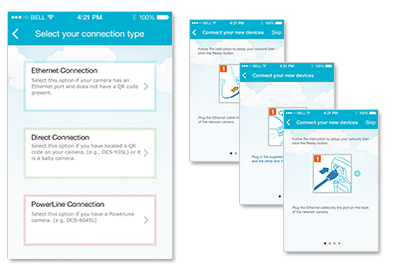 Launch the mydlink Lite app and tap New users, sign up here to start the setup process. If you are using a DCS-935L, select Direct Connection to set up your camera. If you are using a DCS-6045L, select PowerLine Connection to set up your camera. Otherwise, select Ethernet Connection to setup your camera. Follow the steps to complete the setup of your mydlink camera.